Have you noticed that birds are taking flight and having a total fashion moment right now? I was a little skeptical at first, but I've completely underestimated the beauty of birds. Just take a look at some of the gorgeous pieces I found that just might have you flocking to the stores. 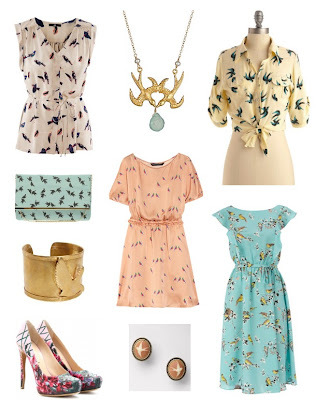 Thats so funny I just bought a bird shirt from target, a bird dress from forever21 and painited birds on my nails! Im actually surprised too I really like this trend. Yeah, I thought it was a really weird trend at first too, but not I'm really feeling it! these are such great pieces! We're on the same wavelength this week with the pastels. Love these picks! Great theme. My sister just purchased a dress from Madewell in a similar pattern. I'm all over that cuff! Thanks for joining the Monday Mingle fun! Love these...I agree, I hesitated at first..kind of reminded me of the owl trend which I didn't love...but a soft print with birds really is growing on me...beautiful picks! These are so cute. I was eying that clutch from asos and that Aqua dress is gorgeous. Prints are everywhere this spring. Love your trendy picks.